AQR Section 18 Exercise 44: NBA or WNBA? Recall that the heights of WNBA players are Normally distributed with a mean of 72 in. and a standard deviation of 2 in., and that NBA players’ heights have a mean of 79 in. and a standard deviation of 3 in. 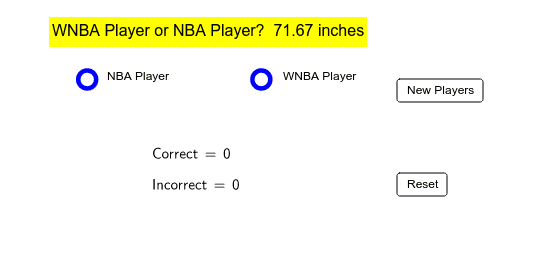 Obviously, NBA players are taller on average than WNBA players. However, it is possible to find a WNBA player that is taller than an NBA player. Likewise, it is possible to find an NBA player shorter than a WNBA player. You are only given the height of the chosen player. How likely is it that you mistake a WNBA player for an NBA player based only on the player's height? Play this game several times. Which players' heights seem to be most difficult to classify as NBA or WNBA?